The head of Kazakhstan's security service, Nartai Dutbayev, has resigned after five of his officers were arrested on suspicion of a murder. The KNB agents, from the elite Arystan combat division, were detained over the death earlier this month of opposition politician Altynbek Sarsenbaiuly. 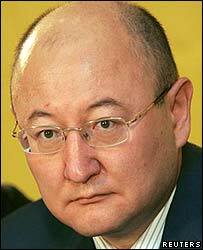 President Nursultan Nazarbayev met Mr Dutbayev on Wednesday and accepted his resignation, officials said. Sarsenbaiuly was the second opposition figure to be found dead recently. A former minister and ambassador, he was an ally of President Nazarbayev until 2003, when he defected to the opposition. His body was found outside the commercial capital, Almaty, with bullet wounds in his back and neck. His bodyguard and driver had also been killed. In November another opposition figure - Zamanbek Nurkadilov - was found dead at his family home in Almaty with a revolver by his side. An official enquiry concluded that it was a case of suicide. But a lawyer for Mr Nurkadilov's family questioned whether it would have been possible for the former mayor of Almaty to shoot himself twice in the chest before delivering a final shot to his head. Opposition groups have accused President Nazarbayev's government of seeking to silence any critics.